At C.A.P Security no matter what your fire alarm requirements are, if you have an issue with a domestic smoke detector or if you would like a system designed and installed in a commercial situation or just need advice, we can help. Since we first started trading in 1996 the British fire regulations have changed many times with the latest amendment being 2013. You can be rest assured that our technical staff keep up with such changes ensuring that you are given the most up to date advice and design. No job is too small or too big, you might have a smoke detector in your home that needs replacing or you might require a fully addressable fire alarm at your place of work, either way we can provide you with what you require. For the domestic environment we can carry out a fire risk assessment and offer advice to private home owners or landlords, we can advise you as to your obligations (if any) and help you decide what products best suits your needs. BS5839 has been very clear for some time now regarding non-domestic fire alarms, new alarms and major additions to an existing fire alarm should have a designer who can be held accountable for the design, an installer and a commissioner, a design will be separate to the installation and commissioning which can be combined. The idea being if all goes wrong at some future date the building management will be able to show who designed the system. Considering how important the accountability of the designer is, it is surprising how many installers install systems without providing design documentation. You can be rest assured that C.A.P Security will ensure that any repair, service or installation complies with current requirements even though in the latest fire regulations this responsibility has been lifted from the maintenance company and passed on to the fire system manger (you!). 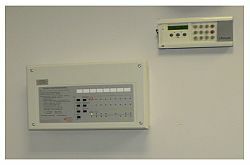 Often other devices will need to be linked to a fire alarm, such as automated door closers, gas shut off valves, lift to ground floor controls and automated calls to the fire services, having said this many fire services will no longer attend a non-confirmed fire in a commercial ,premises during the day! If C.A.P Security are asked to service and maintain a commercial fire alarm system we will introduce a system of device labelling and plan production, if such documents are not in place we will produce a plan of the site detailing all devices and we will start a procedure of labelling each device for easy recognition. We do not charge for this extra work which will take many hours as the resulting documents will help our staff and in many cases will be a requirement for the site in question. No matter what your needs are, C.A.P Security can offer a service second to none, we have 17 years’ experience in the fire industry but are still learning on daily basis as technology and regulations move on, we can lift a load from your shoulders so you can get on with your day to day activities confident that your fire system (regardless of size) is well maintained and up to date.